Over time, as the influencers eventually became influenced by those they influenced, a special hermeneutics of pop music was born. Today, pioneers seem to constantly be reinterpreting themselves through the filter of artistic progress they helped create. In Numan’s case, this would be the music and image of style icon Trent Reznor. Here, Numan candidly discusses rediscovering himself in the sound of Nine Inch Nails and their frontman’s primal scream. I have always believed in the importance of image and that performers should strive to present themselves in a way that their music demands and deserves. Whether it be onstage, in a music video, or in the stills from a photo shoot: you must embody your music. To me, the visuals are no less crucial than the sound. When I first saw the now-famous Nine Inch Nails show at Woodstock on television in 1994, I understood immediately that Trent Reznor had a similar approach to performance as I did. 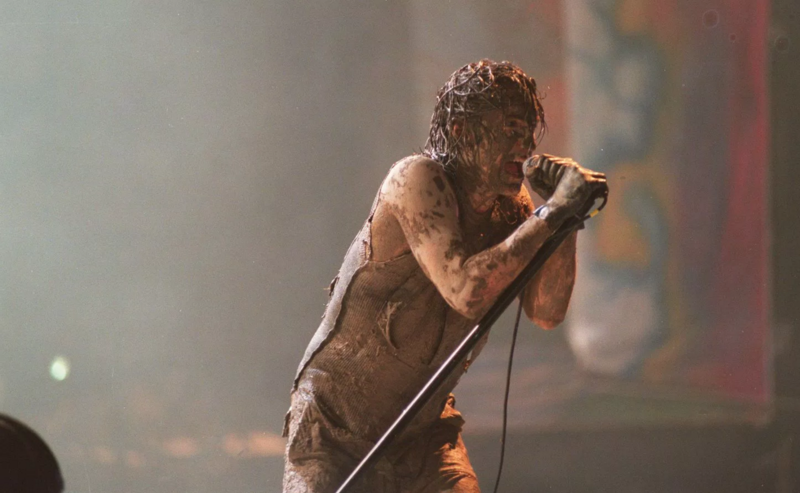 The image is, of course, well known: Trent Reznor standing on stage, covered from head to toe in mud. But the gig it’s taken from manages to surpass even that. It was such an aggressive and powerful performance; perhaps the greatest performance I have ever seen. The initial effect it had on me was quite obvious: I started wearing big boots and other items that represented a complete departure to what I was doing before, sartorially speaking. And beyond these superficial developments lay the music, and it’s really this aspect that has endured throughout the years. That said, without that image of Trent Reznor—filthy and at one with a festival crowd suffering from the fallout of intense rainfall—I would never have been hooked. I’ll be a lifelong Nine Inch Nails fan, traceable back to that first exposure to Trent Reznor. There have been a number of bands over the years whose music I’ve really liked but where my admiration has died when I’ve seen them live. They may sound great, but their image is weak. Or alternately, they might look aggressive, but their music doesn’t follow suit. Wherever the disconnect lies, it ultimately contributes to a weakening of your art. The way you look, the persona you project, the album art, and the way you move are all different parts that have to work in concert for the whole machine to be operational. Trent Reznor has always been extremely adept at keeping the machine well oiled, and I did it pretty well too for my first few albums. However, from the mid-eighties, I lost it really badly. I had a spell, maybe eleven or twelve years, where I changed the way I looked simply to change it, and the careful balance between music and image that I had previously struck fell away. My look no longer reflected the music, the album covers didn’t suit my persona, and the whole artistic entity came crashing down. By about 1992 nothing was working: the music was terrible, the lyrics were terrible, and the way I looked was terrible. Then in 1994 I started to get it back together again. But there’s no denying that I had a period where I went against all of my own original feelings about how to present pop music, which, in hindsight, was probably related to pressure. When I originally started making music there was no expectation. Everything was an experiment. I was writing short stories as a kind of build-up to my early albums and my appearance was a composite of these characters that I’d created. In the early days there were no ideas or planning up front. I was new to synthesizers, so the act of simply switching one of these instruments on and listening to what came out of it was a very haphazard and chaotic process of creation. I didn’t know how to program, so I would just turn the dials and wait and see what interesting sounds would emerge and then build songs around them. It was an accidental means of progress and, because of this, I always knew that I was restricted and that my music could go somewhere far better. When I heard Nine Inch Nails in 1994, it was as if they were realizing the potential of whatever tiny ideas I originally had, except Reznor seemed to take these ideas so much further, sculpting them into a huge, professional sounding onslaught. This was the grown-up version to my naive experimentalism. Years later, a friend of mine named Alan Moulder, who was a producer of many of the big Nine Inch Nails albums, told me that when they were working on The Downward Spiral, Trent was listening to my 1980 album Telekon every morning on the way to the studio. I was blown away. Then, in 2009, Trent invited me onstage with them in London when they were doing their last British show as Nine Inch Nails. When he introduced me, he talked about how he listened to The Pleasure Principle at the very beginning of the band’s genesis when he was trying to shape their sound. To find out that you’ve had a meaningful influence on a band that you’ve admired so much for such a long time—that’s an amazing experience that you can’t replicate. This piece appears in the latest issue of Electronic Beats Magazine.